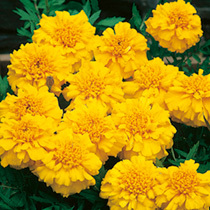 Want the flower size of an African marigold with the compact, bushy nature of the French type? Would you also like a trouble-free, easy to grow variety that never needs dead- heading? Then just get out the BBQ, dig out the deck chair and watch these beauties grow! Height 23-25cm (9-10"). HHA - Half hardy annual. Yellow F1 - Spectacular golden yellow blooms in profusion. Excellent grown with blue salvia Victoria. Toby says: "These are a technical breakthrough. Being a “triploid” type they do not produce seed. Consequently the plant is continually trying to produce seed which means they just keep on producing flowers. So no need to dead-head plants the flowers just keep on coming!" Sow February-May; flowers June-September. Recommended planting distance 30cm (12").